The Landscape Trust had its last lecture of 2018 on Thursday 1st November, 7.15pm at Yealand Village Hall. An illustrated lecture "The Magic of Light" by Laurie Cox was very well received by a large audience. The new website was announced as was the start of the Reserves Appeal for £100,000. The Meet the Villages event was a great success. Even the weather was kind. Well done to Peter Standing and all who helped to make it such a wonderful weekend. The Landscape Trust held their AGM on the 8th June. The present officers, Fiona Allan, Ray Anslow, Mike Warren and Colin Peacock were re-elected as were Gary Marsh, Peter Stevens, and 3 new trustees, Steve Benner, Roger Cartwright and Bob Pickup. We wish them all well and look forward to working with them. In the Chairman’s report, Fiona stated that the Trust had now bought 2 new areas of land. 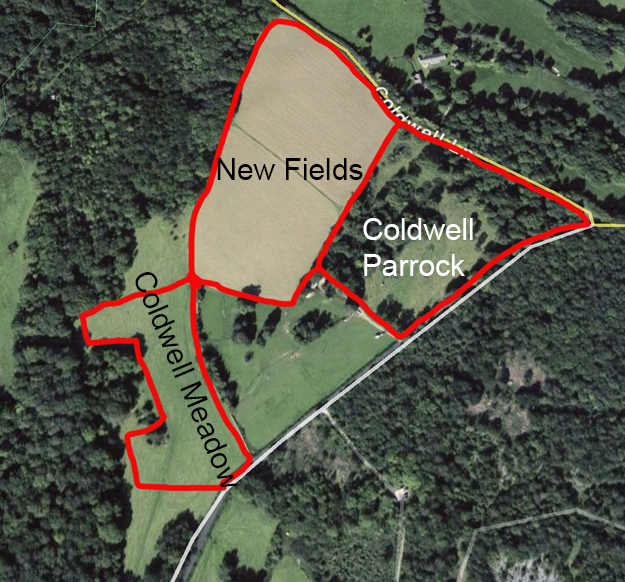 One adjoining Coldwell Meadow and Coldwell Parrock links those two reserves together. The second, “Warton Mires”, was bought in partnership with the RSPB. 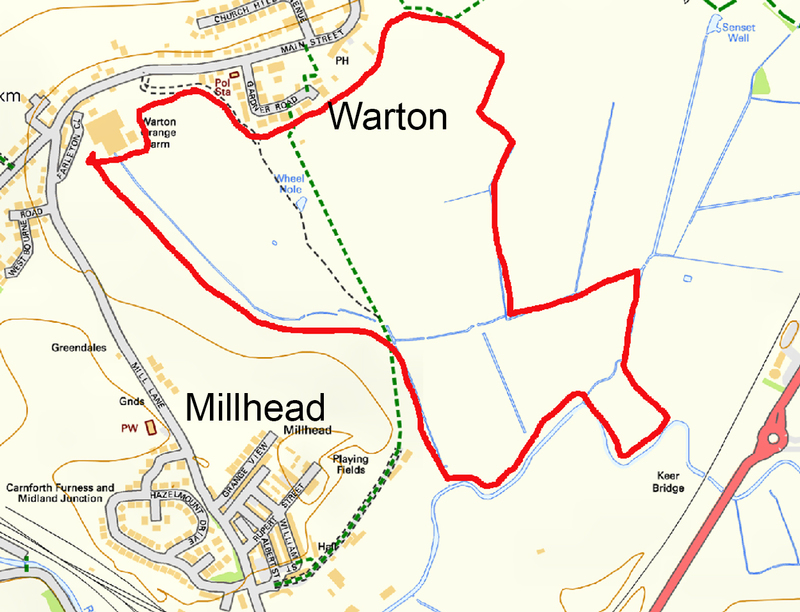 Maps showing the approximate boundaries of the Warton Mires and the amalgamated Coldwell reserves are shown below. The meeting recorded its thanks to Fiona and her team for all the work they had put in over the past year. The Company AGM was held on Friday 23rd March 2018 at RSPB Leighton Moss Education Room: Helen Rawlinson from the University of Cumbria gave a talk "Back on our Map" about the Morecambe Bay area species reintroduction programme. The BCCIC will be helping this project and have already started to look at several species of plants which we wish to save. Following this at the AGM the Business Plan 2018-2022 was adopted, the minutes and accounts were approved, Bob Hamnet and Roger Walton were re-elected and Val Stevens was elected onto the board of Directors. All the papers are available on the Reports and Documents page. In addition we hope to look at the problem of Plastic in the AONB. The Company’s current documents and reports are listed on the Reports & Documents page. As part of our Low Carbon Initiative we have helped Arnside Football Club install LED lighting in their clubhouse. This has been very successful and as well as lowering the energy used the whole clubhouse looks lighter and brighter. We are looking to roll this out in other areas. 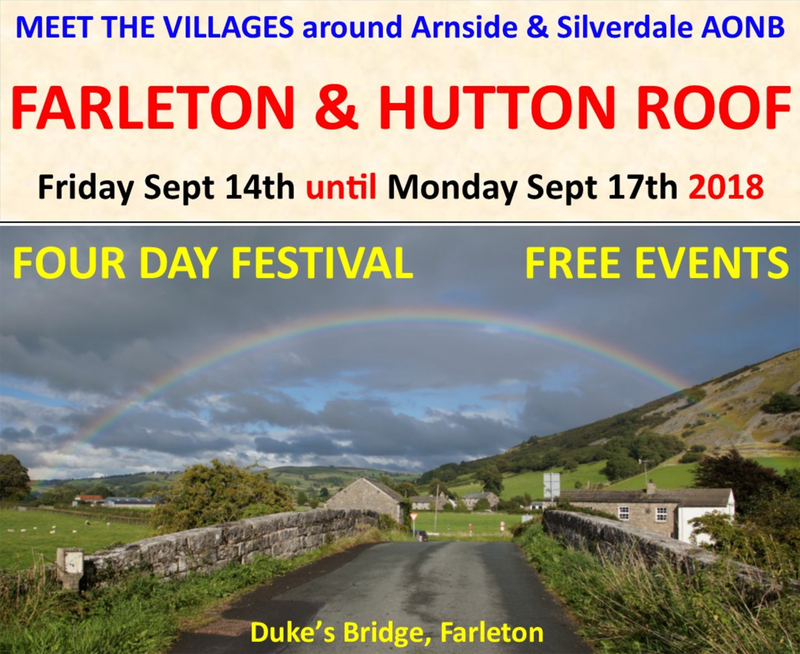 We are looking to donate around £500 to schools or community buildings within the AONB who want to do likewise. 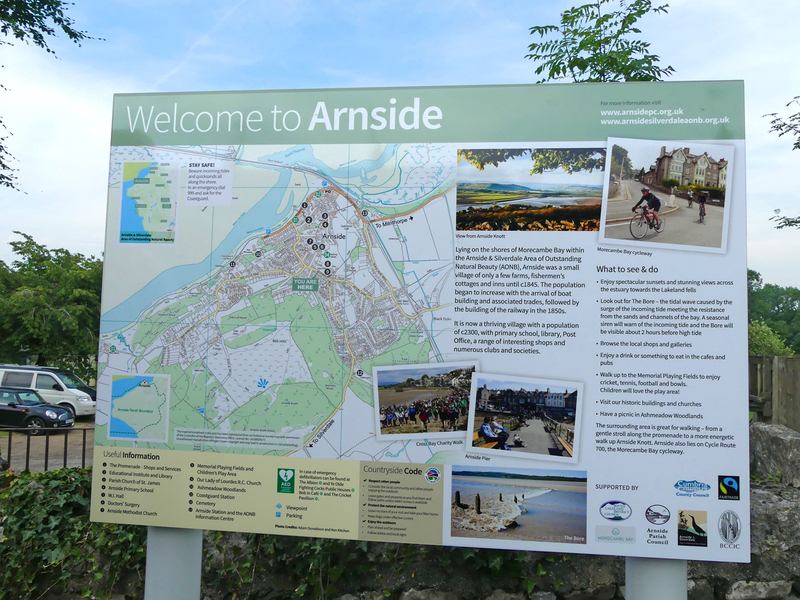 The AONB team has recently been working with Arnside Parish Council on the design of new information panels. It is hoped these will improve the visitor experience to Arnside by providing lots of useful information and ideas on what to see and do. Visitors will be encouraged to support local businesses and explore this wonderful area. The boards are now finished and getting lots of appreciative comments. The Bittern Countryside CIC helped to fund this project and will support the roll out to other parishes within the AONB. The boards for Beetham will soon be finished and those for Silverdale should be next. This was held at RSPB Leighton Moss on Friday 10 March 2017. Two speakers, from National Grid, gave an interesting presentation on proposals to connect the proposed Moorside Power Station at Sellafield with the main electricity network near Heysham and, in particular, the proposed tunnel to take the cables under Morecambe Bay. The Community Renewables Initiative was based on raising funds to facilitate the installation of solar pv panels on community buildings. The surplus electricity which the building does not use is sold to the Grid and an agreed proportion of the income is kept by the school/village hall, with the remainder coming back to the CIC to fund the next installation. Storth School was the first building to benefit from the initiative in February 2012. While generating electricity for the school, the project also forms part of the school curriculum, promoting alternative forms of energy and a more sustainable lifestyle to pupils, their parents and the wider community. In the first year the panels generated 3122kwh of electricity. 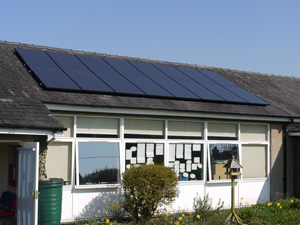 The feed-in tariff received in the first year amounted to over £1400 and the school's electricity bill too was reduced. The School has now bought back all the shares in the feed-in tariff allowing the BCCIC to offer help to another school. Leeds Children's Holiday Centre and Silverdale School were the next to benefit and the three schemes to date have already generated about 40,000kWh of electricity. The AONB office was the latest building to be added to the programme. Following a change in the ownership of Leeds Children's Holiday Centre, the solar panels are no longer required there, but have since found a new home and are continuing to generate at Lakeland Wildlife Oasis. Unfortunately the change in Government support means that we are not doing any further installations at the moment.